This is a conceptual art installation piece created by Stefan Brüggemann (1975-) in 2001. 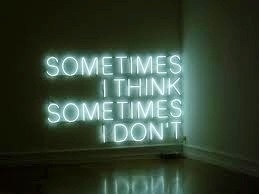 It is made of white neon. And it’s very alluring to look at. Agree? Sometimes I think, sometimes I don’t, but recently I have been thinking about you. A lot. The past weekend was especially tough to live through. I carry you in my heart all the time. Then I came across this quote read on a TV show. 5 It does not dishonour others, it is not self-seeking, it is not easily angered, it keeps no record of wrongs. It’s time for me to let the perceived wrongdoings and grievances that I felt deeply about go, so I can focus on living my life the right way and not be burdened by the past that is draining my motivation. Then maybe, just maybe, I can start afresh.